The French Broad River is the second oldest river in the world, which makes it older than my great, great, great granddad. And he’s old. So old in fact, that it has developed a certain smell only found in this particular waterway. Although the whole river is great to paddle, Section 8 is one of our favorites. This is a 5 mile (ish) section downstream of Marshall NC, about 30 minutes north of Asheville NC. Section 8 begins below Redmond Dam, and takes out at Barnard (the put in for the most famous section: Section 9). 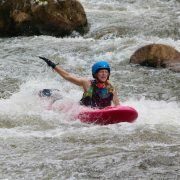 Section 8 is rarely traveled, but is the perfect section for new paddlers, or those looking for a family friendly float. There are no real ‘rapids’ on this section, but what makes it fun is that there is consistent gradient from put in to take out, making for a nice ‘moving sidewalk’ of current. There are also many eagles and otters that live along this mostly unpopulated stretch of river. If you’re also on the hunt for somewhere to stay, one of the French Broad River Paddle Trail campsites is on this section. Are you seeing a pattern here? This section has been written about before, and is the location for the evolution and development of Bellyak more than any other stretch of river. 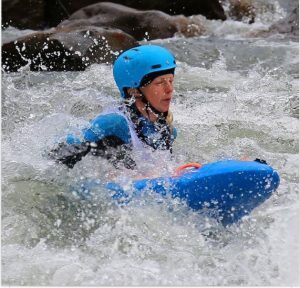 This is a great section for beginning whitewater training, with an instructor. In the four mile stretch of river between Barnard and Stackhouse, there are multiple Class 2 and 3 rapids that offer many different ways to go down, from easy straight down the middle to maze like runs that require precise navigation. At higher levels this section can be quite pushy due to the amount of volume coming down the river. 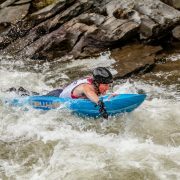 For Section 9 rapid by rapid, check out our Where to Bellyak: French Broad Section 9 post here. 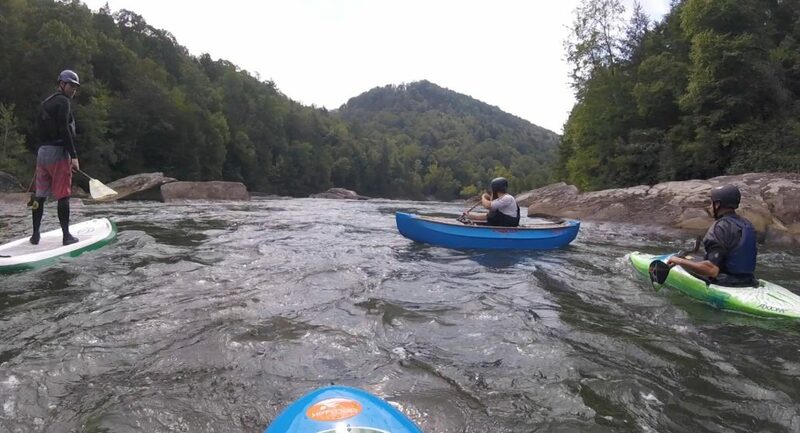 This section of river, beginning at USA Raft in Erwin TN and ending at Jackson Love Bridge, is a perfect section for those looking to taste a little whitewater action in a perfectly clean and pristine river. The Lower Nolichucky is approximately one hour north of Asheville, and flows year round. Contact the folks at USA Raft to book your trip. They have expert guides, hot showers, and beautiful accommodations right along the river. 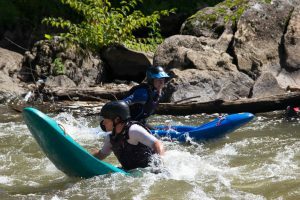 On the books to be named a Wild and Scenic River, the Nolichucky Gorge flows through the deepest gorge in the Southeast. 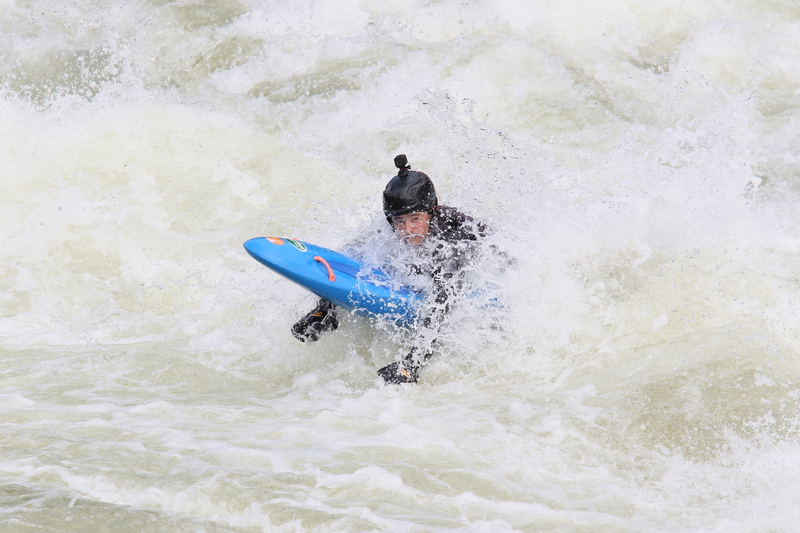 Over 8 miles of amazing whitewater that will delight and test the most avid of paddlers. Rapids such as Quarter Mile, surf spots like Jaws, and miles of beautiful scenery in a pristine gorge make for an amazing day on the water. 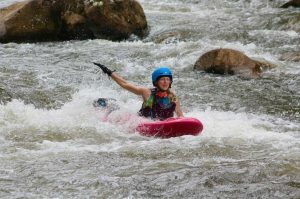 For those inexperienced, having the experts at USA Raft guide you down is the way to go. 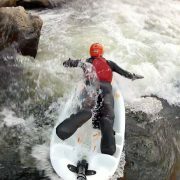 40 minutes north of Asheville is the best section of whitewater Bellyaking known to man. The Big Laurel River. Flowing out of the shadows of Mount Mitchell, the Big Laurel is a tight, low volume creek popular with fisherman that flows into the French Broad River below Stackhouse. The Big Laurel has a trail running along the side which allows for easy scouting and portaging if necessary. Rapids such as Triple Drop, Suddy Hole, and the Narrows provide exciting, technical rapids in a beautiful setting. Check with the folks at Laurel River Store for good levels. Levels from 3” to one foot are ideal. Over a foot and the spice level goes up exponentially. Great surfing right at the put in at Cabin Wave. Standing in the shadow of so much gnar, Section 9 of the French Broad is often overlooked as a beginners-only run. Only 45 minutes from Asheville and with a quick shuttle, Section 9 is good at almost all levels. It is a popular run for SUP, bellyak, and all other manner of river craft, due to the year round flows, beautiful scenery, and good play. The multitude of read and run rapids don’t hurt either. The reason I love the Play 35 is the same reason Bill Wunderlich, 2 time Tennessee State heavy weight wrestling champion loves the Play 45: it just fits. 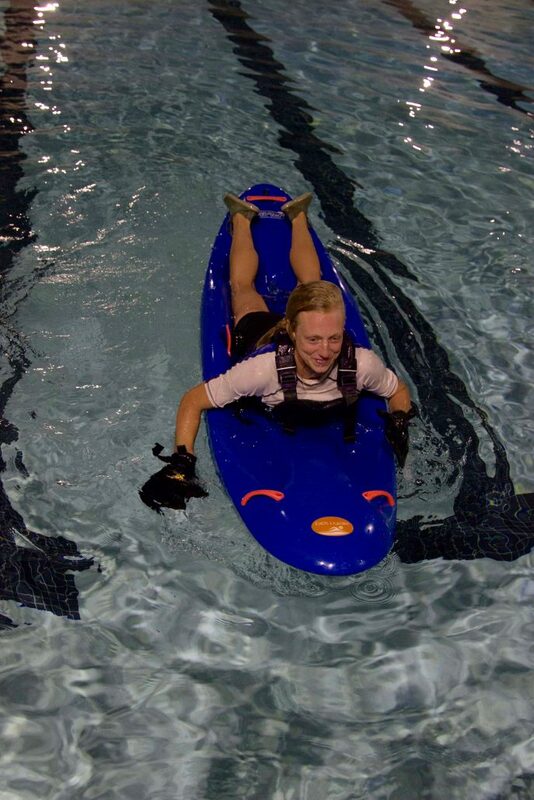 When I first cruised on a Bellyak I made it down the Class 4 waters we were paddling with a huge smile on my face. I’m sure that was the only pretty thing that day because I had only a taste of what was possible. Now, 2 years later, my bellyak and I have been getting down right nasty. While the barrier to entry is low on a bellyak, the level that you can take it athletically seems to be limitless at this point. Taking my game past the point of river running and basic belly surfing required me to tap into my friends named agility, strength and finesse. This is what I really love. I love how agile the Play 35 is. If you give it a little nudge you can go places together. 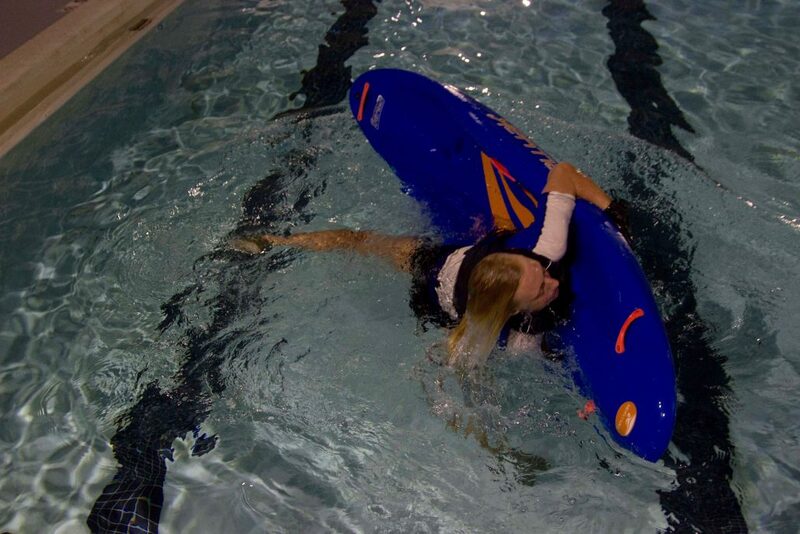 The boat is designed to be stable enough to inspire confidence but with an agility derived from the advances in hull design of modern freestyle kayaks. 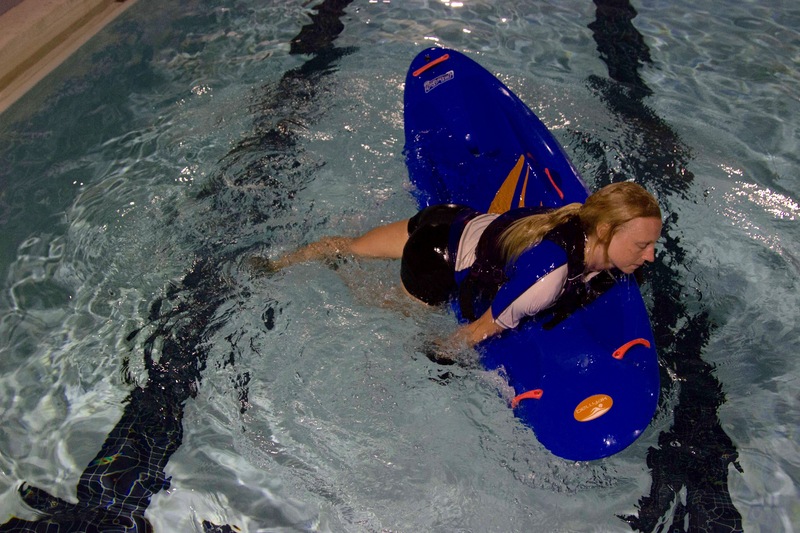 The ample rocker allows the boat to spin and pivot with ease. I knew it had potential because on my first ride it spun me and took me places I never intended on going. Once I made the commitment to work together with my Play 35, I was hooked. Confidence and communion with the river is something I have been able to achieve in a greater way than I ever could in my kayak. Perhaps it’s because my body covers more surface area on the water. Perhaps it’s how I”m able to respond to the river rather than just reacting to every single current that comes at me. 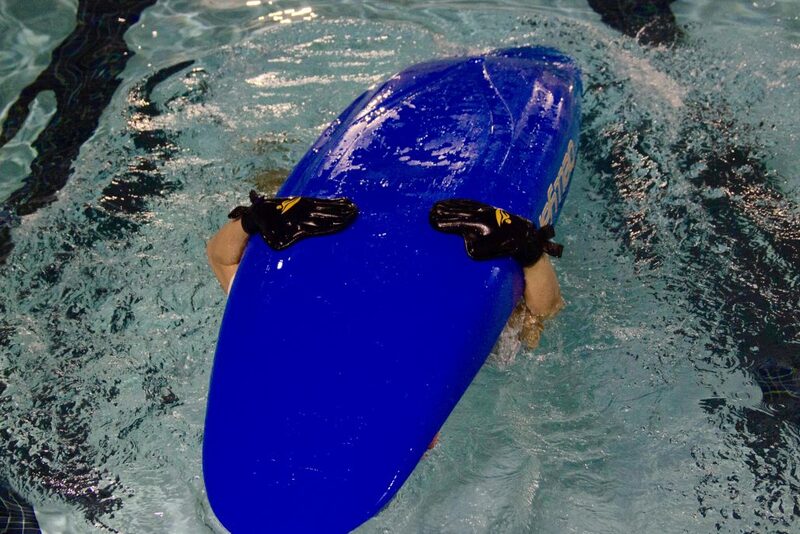 Nothing says New-Age spiritual like surfing a wave in a bellyak. 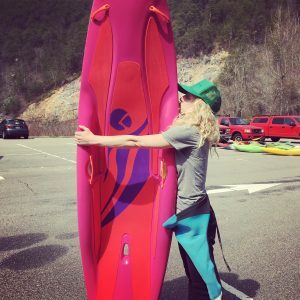 One of my favorite pastimes is surfing at staging eddy on the Ocoee, watching creekers in full faces practice their roll in the eddy next to me. And as I write this I can’t help but laugh a little because in a few years our experience today will seem so underwhelming by the standards of what will be created tomorrow. 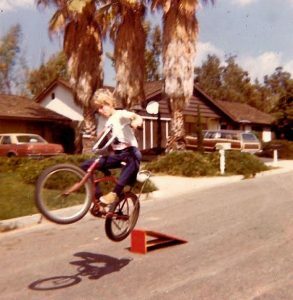 Like jumping curbs back in your huffy bike glory days thinking you were all that therewas in the world only to learn that mountain biking was already a thing and you were living a lie. I have to admit I used to be a little bit of a freak about getting a workout in and I’ve always dreamt of legitimately having fun and being fit at the same time. 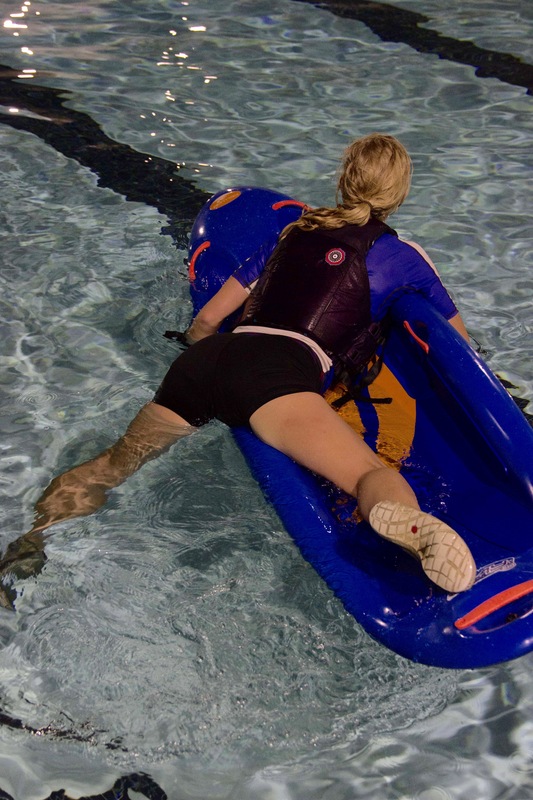 I like ball sports but they still hurt when I’m tired, but have you heard of Bellyak Fitness? My idea of Bellyak Fitness is taking my bellyak whitewatering and playing as hard as I can only to find out when I am done that I am completely exhausted, my hip flexors are more open than that can of worms you opened when you asked your grandma how she was today, and my arms and abs feel like I’ve been on that crossfit diet. All the while I was just having fun. Really there’s not much I love more than river running on the bellyak which is something almost all of us can do whether it’s on class II or Class IV. 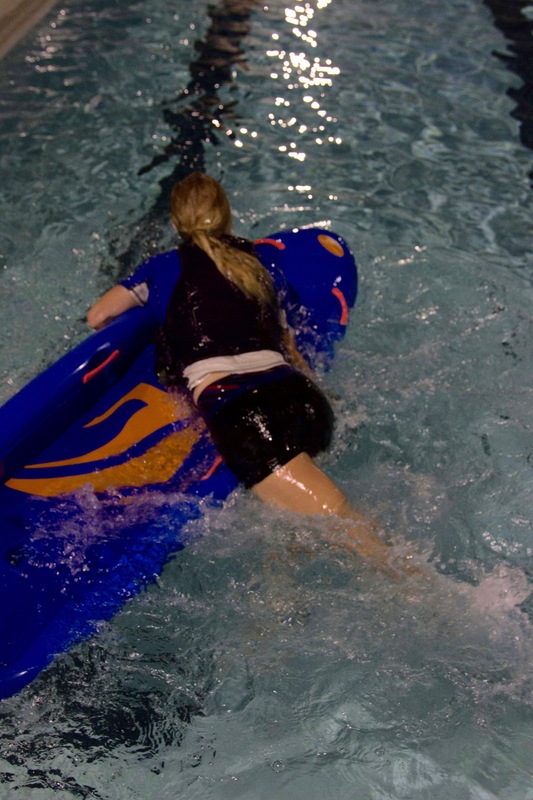 I love many water sports, but the one that makes me giggle the most at the same time challenge me is bellyak. Aside from swimming, it’s the closest I have been to really being a part of the water. 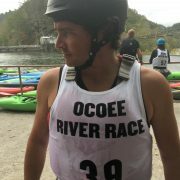 The 2017 Ocoee River Race, sponsored by the Tennessee Valley Canoe Club, had over 130 racers this year. 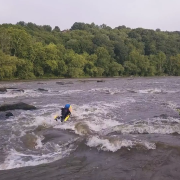 This is a challenging downriver race, requiring hundreds of small moves to stay in the fast water to make it down the 4+ mile Class III course. 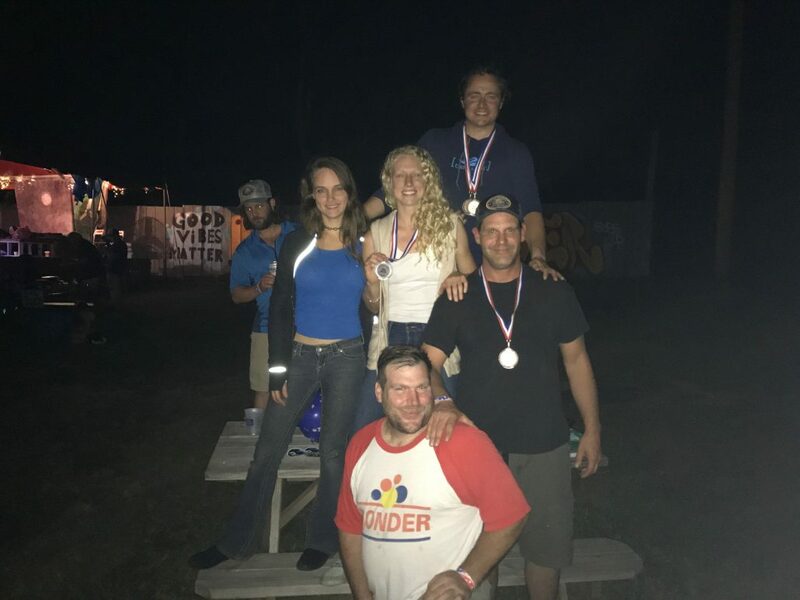 Team Bellyak represented with our own category and five racers this year. 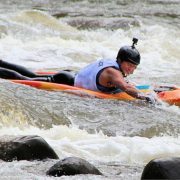 To post a fast time, it’s not so much about being fast in the rapids, as much as it is about having the smoothest line between the end of one rapid and the beginning of the next. 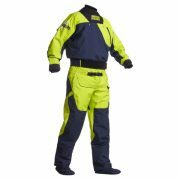 Each rapid has multiple ways to run, with a fast ‘race line’ through every feature. Racers are released in one minute intervals to race against the clock. 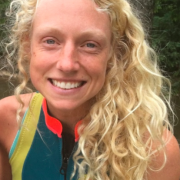 “Every year I’ve raced in men’s hand paddle (as that is the closest category to bellyak), and I like to pretend to hurt people’s feelings, or at least make them realize we aren’t messing around. I’m wearing webbed gloves, and they are using large plastic hand paddles. I won the category in 2012, and since then we’ve created our own category. For the past three years I’ve come in right behind the hand paddle master of the southeast, Keith Sprinkle. 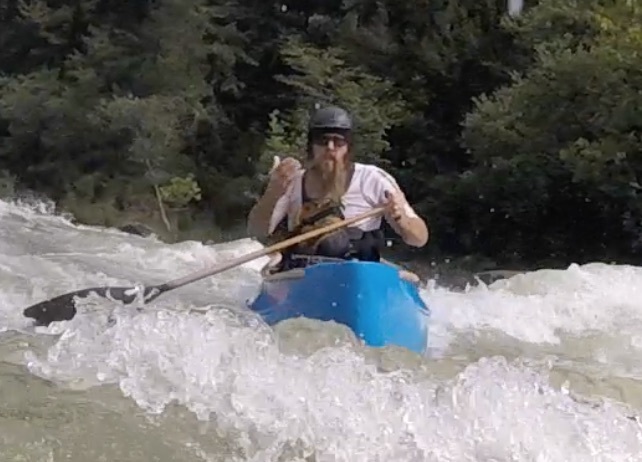 Plus, I just want to race bellyak in as many categories as possible. 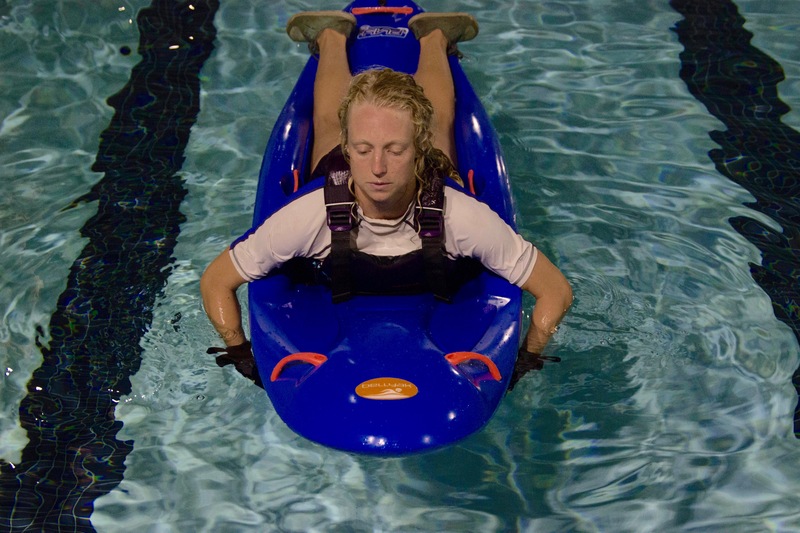 The Frequency is the fastest boat in the bellyak lineup, at 8’7″. 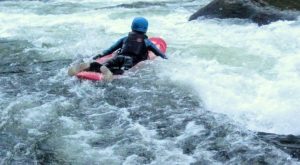 The flip up skeg is designed to work in whitewater, and the Ocoee is a rocky, shallow river – a perfect place to put it to the test. The skeg allows the boat to stay on course in the squirrelly water between rapids, thus making it much more efficient to paddle quickly during the transitions. 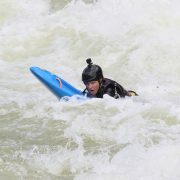 After racing back-to-back with and without the skeg, I’m convinced of it’s effectiveness for going fast in whitewater. 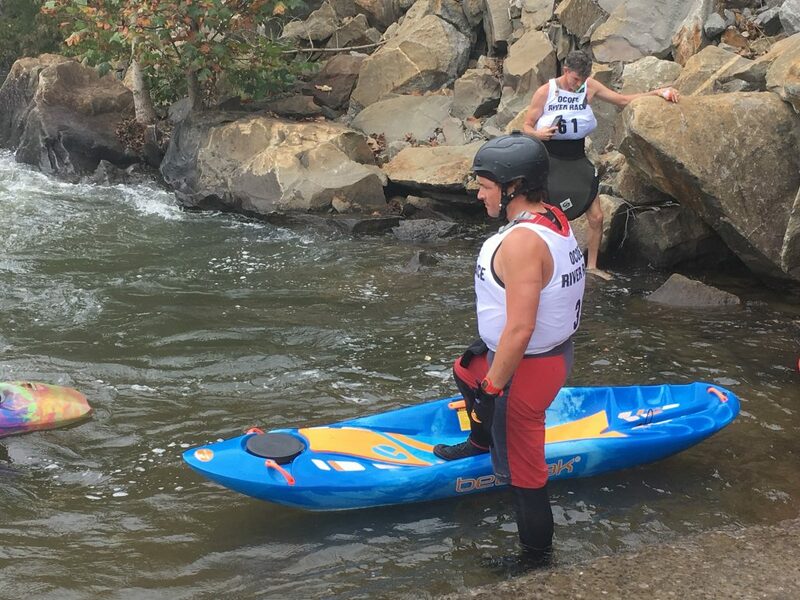 Adam finished in third place for Men’s Hand Paddle Kayak, with a time of 39:15. The rest of Team Bellyak had start times 50 minutes after Adam (since he was the only one racing two categories). As soon as he was done with race lap number one and partially recovered from the lactic acid overdose and weird tracers he was seeing around everything, he jumped in the van and headed back to the top. “My second run was clean. I made no mistakes and stayed steady throughout the run. However, the absence of the skeg was very noticeable as I had to put substantially more energy to keep the boat on course. I was mildly delirious as the end of the run and grateful for all of Team Bellyak standing on the bridge above the finish line cheering for me! 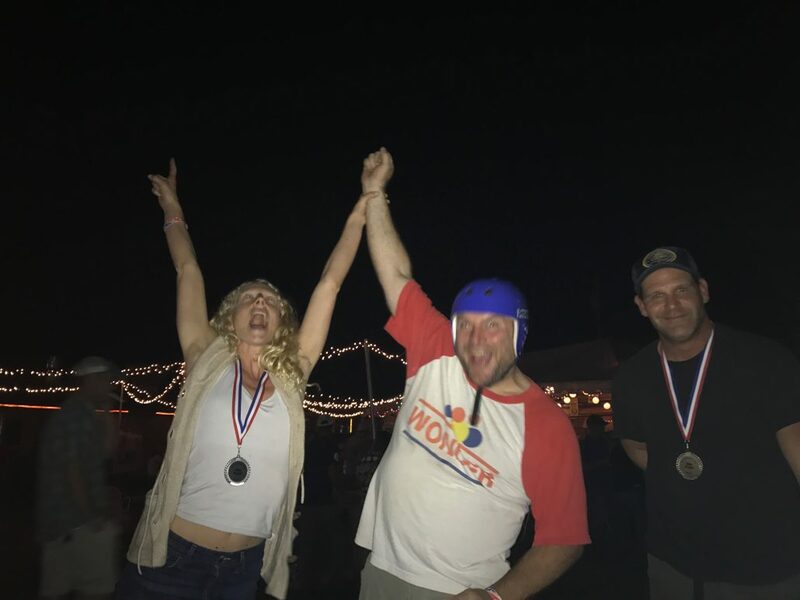 First Place: Adam MastersPrize: Webbed belt, Aquaseal, two pound bag of ‘America’ Skittles, 24 Ounce engraved beer stein. 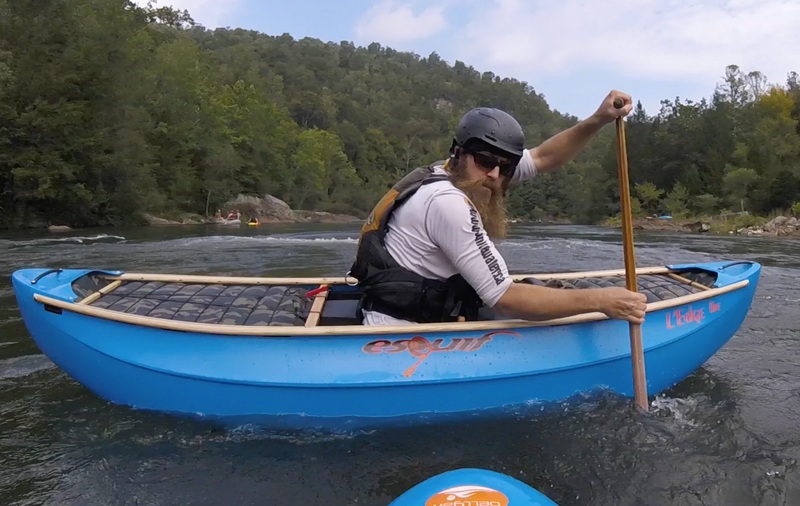 This sums up how we feel about racing the Ocoee, and shows Bill’s awesome helmet prize. We had the most fun! Especially that guy in the back.